I really didn’t plan on commenting on this. Various personalities on the Internet seem to be doing a fine job at covering the various issues tangled in this story. However, this twisted mess recently ventured into my world: issues of copyright. Now, I realize it’s pretty silly to expect someone who violates the legal rights of entire groups of people to respect copyright. But, Mike Huckabee, Ms Davis and their crew of ne’er-do-wells appear to have done just that. Sounded great. Quite dramatic. She even managed tears. Problem is, they never got Survivor’s permission to use “Eye of the Tiger” and the band’s response to this unlicensed (ha, see what I did there?) use is less than good. According to TMZ, cease and desist orders have been sent. Neil’s rep tells us Trump never got permission to use the song for his candidacy announcement, and furthermore — Neil, a Libertarian and Canadian citizen, is NOT down with Trump’s campaign. We’re told he’s actually backing Vermont Sen. Bernie Sanders. 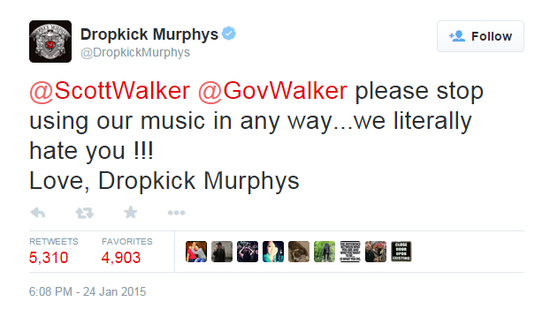 But let’s talk about copyright for a moment, shall we? If I were in charge of any kind of campaign (ha. That’ll be the day), I’d tread very carefully when it came to selecting music and obtaining the license to use them. Reason? This is an activity that can backfire. Big time. For example, according to Rolling Stone, some campaigns get permission, but then staffers muck it up. Sigh. At least they tried. Mitt Romney evidently used a K’Naan song and K’Naan threatened legal action. John McCain used Jackson Browne, Foo Fighters, and John Mellencamp melodies and all objected. Browne sued… causing embarrassment and back pedaling from the campaign. What bothers Browne almost as much as McCain’s lack of permission, the lawsuit alleges, is that using “Running On Empty” suggests that Browne supports McCain’s presidential campaign and the Republican platform. “In light of Jackson Browne’s lifelong commitment to Democratic ideals and political candidates, the misappropriation of Jackson Browne’s endorsement is entirely reprehensible, and I have no doubt that a jury will agree,” Browne’s lawyer Lawrence Iser said. So yeah… for Huckabee and his clan to cite ignorance on this subject would be a dubious claim at best. And to not respect the rights of a copyright holder tells me a lot about what they think of the artists who create the songs they so blatantly steal. 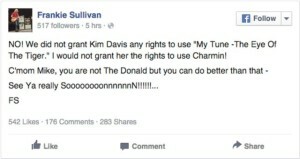 Sullivan previously sued Newt Gingrich for playing “Eye of the Tiger” at campaign events without authorization. It will be interesting to watch this scenario unfold. Hat tip to Penny Pederson for bringing this to my attention. Thanks! The next issue of Writing Etc.